The birth of a child is a miracle of its own. However, another, a bit slower, but just as fascinating miracle happens throughout the first year of the child’s life. Namely, the baby’s brain doubles its size during the first year. This fact alone signifies that there are many things going on inside that incredible mind. Here are the things that your kid learns during the first twelve months. As it occupies your life and space, your baby will begin to take control of their body. First, they will start lifting their head and recognizing the faces of parents. This is the time when your baby starts making their first sounds. 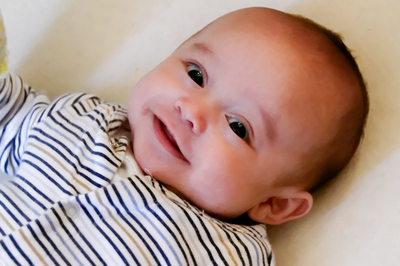 By the time your baby turns two months, you may even see the first deliberate smile. 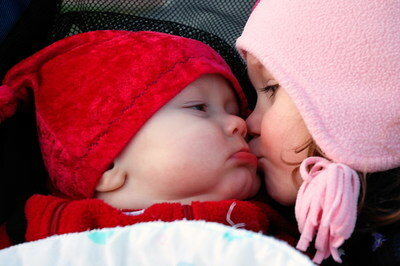 Cooing and blowing bubbles are the first reactions and communication attempts with you, so cherish them. During the third month, your kid will start trying to mimic your expressions. To help this development, speak to your baby frequently and freely. Hold them and respond quickly to their cries. When holding them, make sure that you switch the positions. During this period, the motor skills of your baby will become even more advanced. They will start accepting the weight on their legs, start using hands to support themselves when sitting and they will gladly toss and turn when put to lie down. However, besides the motor skills, the communicative skills will also grow. Your kid will use the babbling and other new sounds to get your attention. Plosives “b” and “p” will be gladly used to form cute babbling in the attempt of communication. Sounds are the focus of this age. Babies start fearing noises and they start showing interest in toys that produce sounds. Therefore, talk, read, play music and let your baby enjoy the sounds that it craves. The baby is finally mobile. The good news – you do not have to carry the baby all the time. The bad news – you have to catch it and keep it safe. Your child will start eating different food now. The communication skills will definitely increase. Your child will be able to pick up the emotion from the tone of your voice. They will communicate using facial gestures, sounds of a wide range, laughter and the like. However, they will develop stranger anxiety at this time, as well. This can be overcome by using services of an early learning centre. Also, it may help with establishing daily routines and better communication skills. It will also create free exploring environment that is essential for your child’s mind that is starving for knowledge. Now is the time when you should be careful about separation issues. Your kid will star being very clingy when it comes to you. However, as soon as you leave, rest assured that those tears will stop in a couple of minutes. Try leaving without making too much of a deal about it. This is because, at this age, their attention is easily disrupted and they need many activities one after another. They are becoming aware of the objects even when they are not within their sight. By the time, your child turns one, they will be aware that objects have purpose and they will mime using those objects. Pressing buttons on the remote control, miming talking on the phone and the like. Play peek-a-boo with your child. Remove everything that can hurt them and let them explore endlessly around the house. This is a very exciting period in your child’s life. They will change so much and they will go from hardly recognizing you to playing simple games with you and exploring the home. Enjoy this magical time and save the memories of it.